CHARLESTOWN, RI – The United States Mint (Mint) joined representatives of the U.S. Fish and Wildlife Service today to launch the America the Beautiful Quarters® Program coin honoring Block Island National Wildlife Refuge in Rhode Island. This is the fifth and final coin in the program for 2018. Block Island National Wildlife Refuge is a critical migratory bird stopover point on the Atlantic coast. The reverse (tails) design of the quarter representing this site depicts a black-crowned night-heron flying above a view from the beach at Cow Cove that looks towards Sandy Point. The North Lighthouse is seen in the background. The design is by Chris Costello, a Mint Artistic Infusion Program artist. He was recognized for his artwork during the livestreamed ceremony. Mr. Ryder shared the stage with James Kurth, deputy director of the U.S. Fish and Wildlife Service; Janet Coit, director of the Department of Environmental Management, who spoke on behalf of Governor Gina Raimondo; and Charlie Vandemoer, manager for the Rhode Island National Wildlife Refuge, which oversees the Block Island National Wildlife Refuge. The Chariho High School Student Choir, students from Chariho Middle School, and members of Boy Scout Troop #15 also participated in the event. The customary coin exchange rounded out the event. The Block Island National Wildlife Refuge quarter is the 45th release in the United States Mint America the Beautiful Quarters Program. The program is authorized by Public Law 110-456 and is a 12-year initiative to honor 56 national parks and other national sites. Each year for the duration of the program, the public will see five additional national sites depicted on the reverses of the America the Beautiful Quarters coins. The final coin will be issued at the end of the program in 2021. The Mint issues these quarters in the order in which the honored sites were first established as national sites. 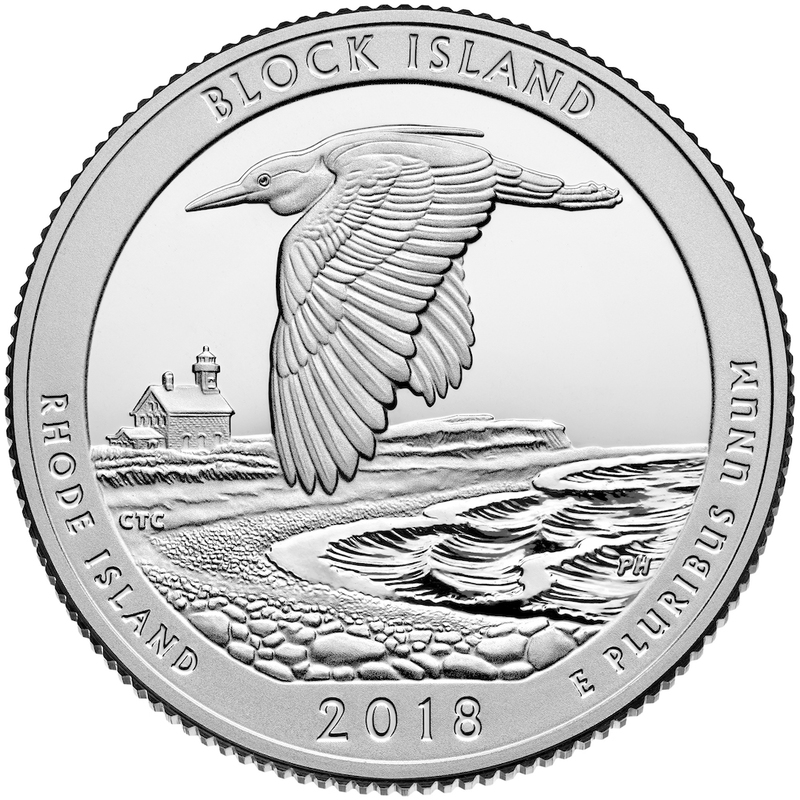 Products featuring the Block Island National Wildlife Refuge quarter are available for purchase directly from the Mint’s online catalog at catalog.usmint.gov/coin-programs/america-the-beautiful-quarters-program/ or by calling 1-800-USA-MINT (872-6468).